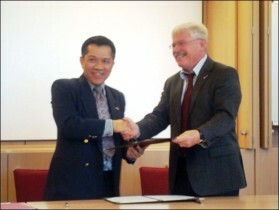 A group of PSU executives visited two universities in Germany from October 23-30, 2010. They were led by Associate Professor Dr. Chusak Limsakul, Vice President for Research and Graduate Studies, and Associate Professor Dr. Chatchai Ratanachai, Vice President for Outreach and International Affairs. The main objectives of this trip for the Thai delegates were to meet and discuss future collaboration between PSU and Otto-von-Guericke University (OvGU), Magdeburg, in the areas of Logistics, Energy, Engineering, Management and International Affairs. Moreover, a one day visit to Martin Luther University, Halle, was arranged, in order to discuss collaboration in the areas of Agriculture and Nutritional Science, Economics and Business, and International Affairs. On this occasion, the Memorandum of Understanding (MOU) between PSU and OvGU has also been signed. The possible collaborative activities concern curriculum development, staff and student development, joint research, etc. 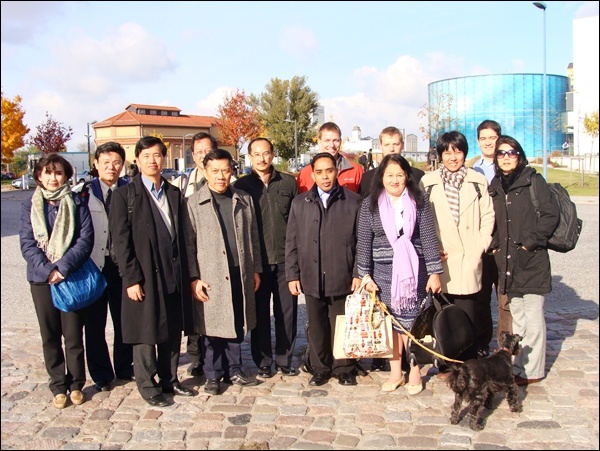 This trip allowed the Thai delegates to meet and discuss with German professors from Otto-von-Guericke University and Martin Luther University, which will lead to concrete academic collaboration in the near future. Furthermore, the knowledge and experience that the Thai professors get from this trip will help strengthen the academic aspect of PSU. Regarding the international affairs, both sides met and discussed closer future relationship.